Earlier this summer, I bought a huge bag of yarn at the Salvation Army Store, and in it were many balls of Plymouth Encore yarn, in nice-enough colors. 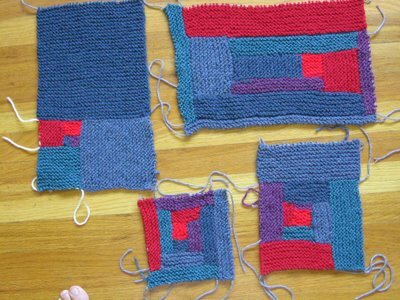 At some point, I visited www.Januaryone.com, and she was making a Log Cabin blanket… The light bulb flashed in my head and I said, “That’s it!” This is turning out to be loads of fun, and quite the learning project, too. The whole fun of Log Cabin is to use many different colors, which means many loose ends to weave in later. 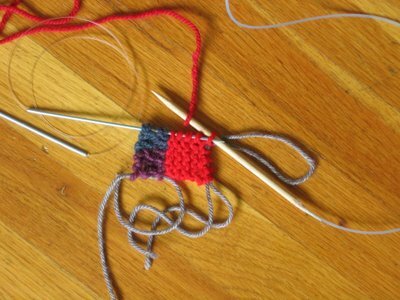 Well, I decided that this was just foolish – OK, really, I’m just lazy - so I start out each color, and I also end up each color, already woven in, so to speak. Are you familiar with the Russian Join, or Russian Splice? Google it. 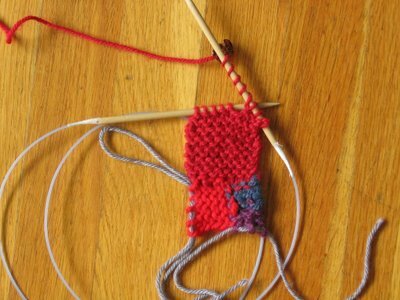 It’s the best way to end one piece of yarn and begin the next, without leaving any tails or knots to worry with later. It’s also fairly easy to change color predictably, as I’ll show you in a minute. 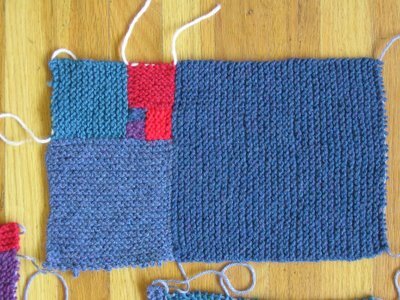 First, notice that in the Garter Stitch construction, you need to *start* your new color on the *right side. * If you start on the wrong side, then you’ll get those odd, but sometimes desirable, little middle-of-the-road stripes. So, this means that you need to *end* your colors at the end of the *wrong side* row. 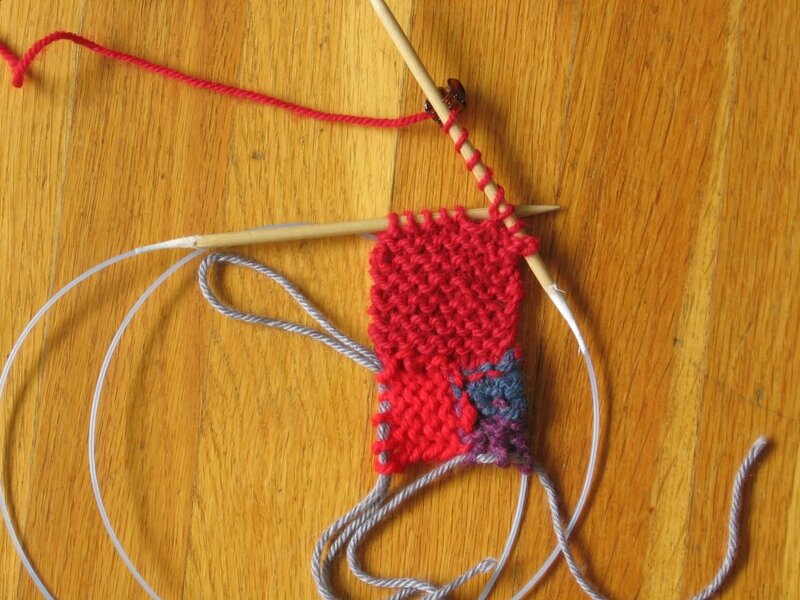 Keep this in mind, as you knit. Now, all of the directions call for binding off each log, only to turn around and pick up along this edge. This seems silly. Just keep those stitches live, and come back and knit them later. Easy, plus you don’t get a bound-off edge in the middle of your knitting. 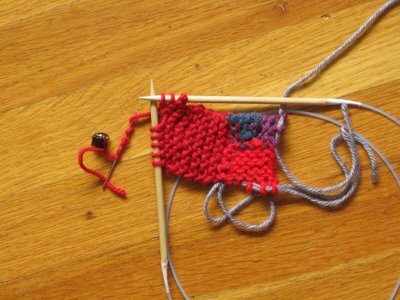 What’s the point of suffering through miles and miles of garter stitch, the slinkiest and drapiest of stitches, only to make stiff ridges all over the place? Now, back to the Russian Splice. 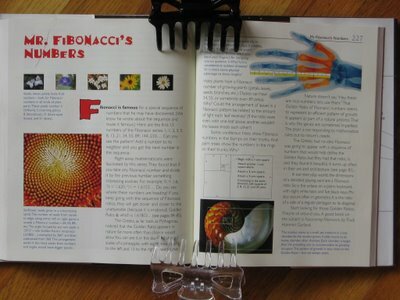 I won’t attempt to teach it to you here, as there are a million wonderful tutorials already online. My fave is at www.boiknit.blogspot.com. 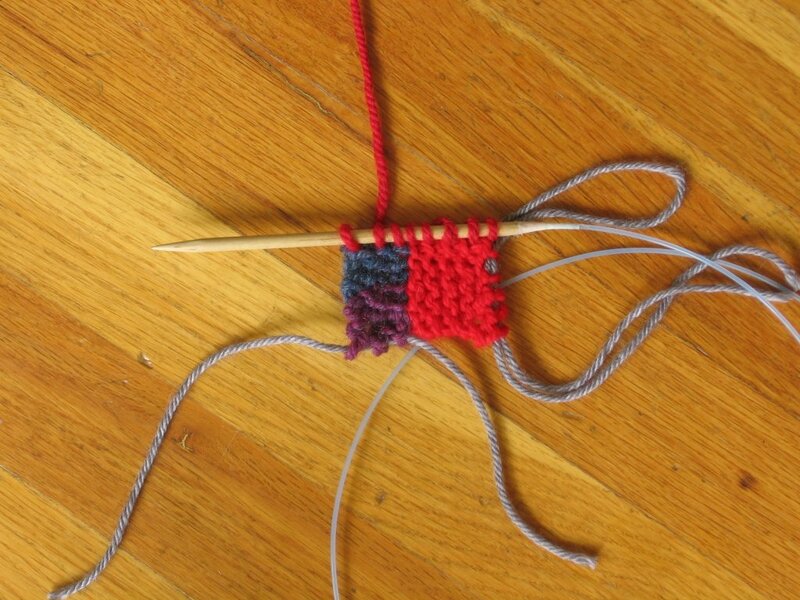 I started each new color with one half of the Russian Splice. Here you see me preparing to pick up along one edge. I picked-up the stitches with a small-gauge metal needle, simply because it was handy. 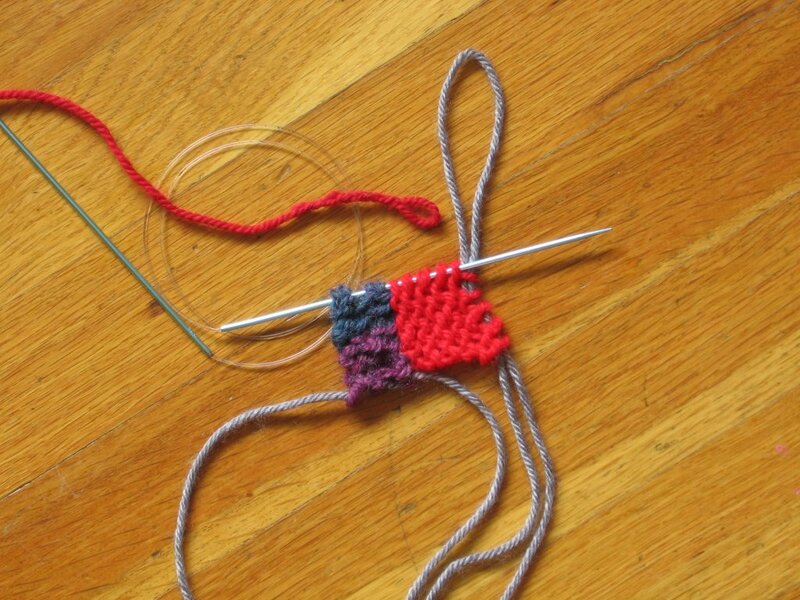 It is much easier to use a skinny needle for picking up along the garter stitch edge. 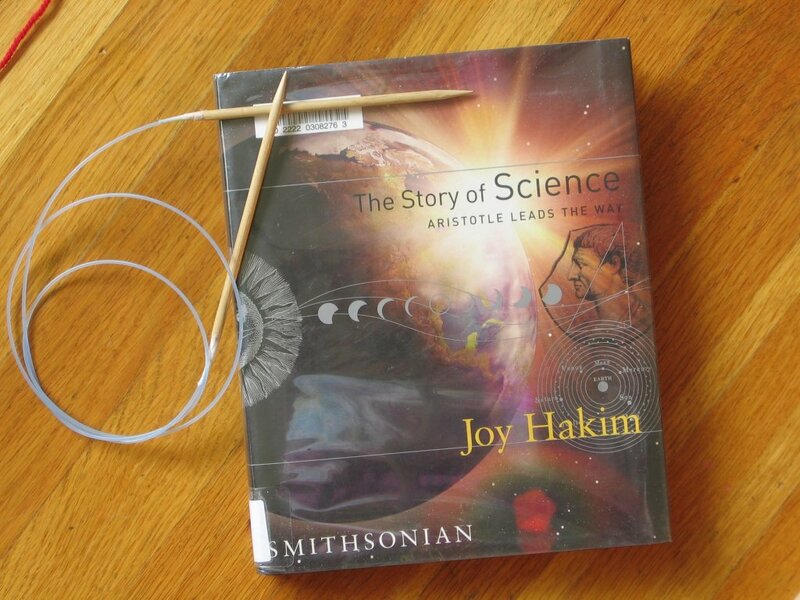 Here, I’m beginning with my “official needle,” one of my beloved wooden circulars. 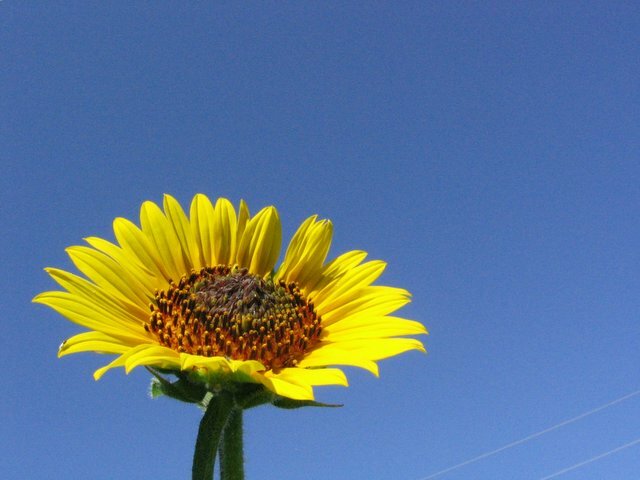 Notice that the first row is a right side row. I’m five stitches short of finishing the row. Notice that I’m on the wrong side of my work. 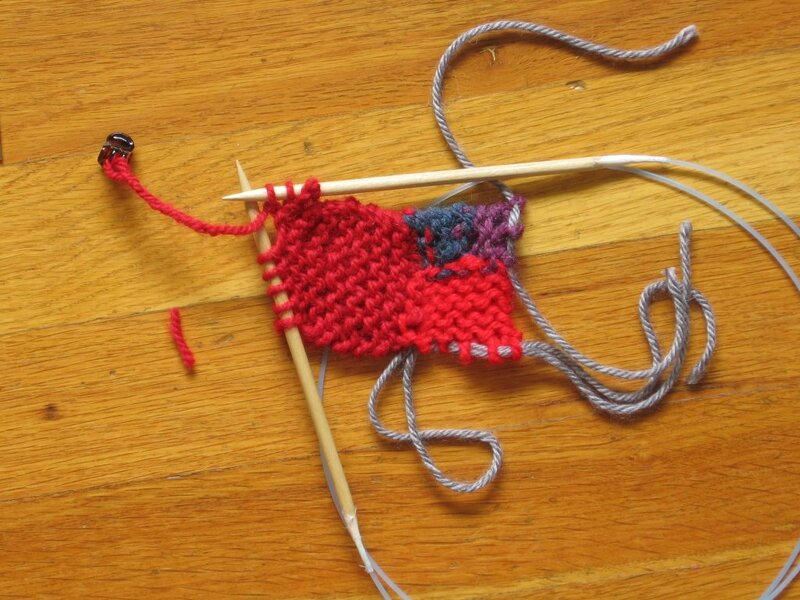 Also notice the lack of yarn ends. *smile* I’ve wrapped the yarn five times around the needle, and marked the end of the fifth wrap with a teeny-tiny hair clip. Maybe you have something handy? Paper clip? The corner of a binder clip? 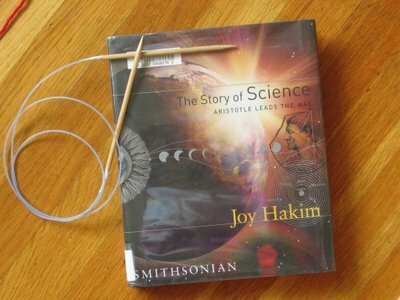 Thread this point of the yarn onto a tapestry needle? You’ll think of something. 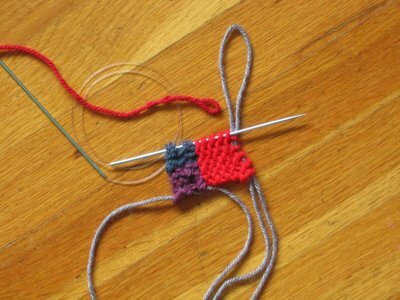 Leaving the tiny hair clip in place, I’ve cut the yarn, and am weaving it back and forth, with tiny stitches, back through the yarn, to accomplish the Half Russian Join. 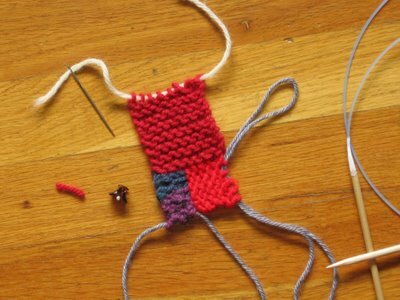 Pull the yarn end through, and then clip it off, flush. 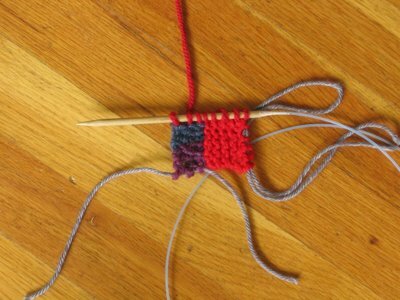 If this were a really nice wool yarn, I’d now wet my fingers with spit, rub the place where the yarn end is located, really well, between my thumb and forefinger, and never see this yarn end, ever again. Since this is a wool-acrylic blend, it would be a waste of effort. This end is going to worm its way back out, and give me fits, at some point in the future, but I like to think positive. Leave the little hair clip in place, and knit across the row. That last loop, which is held open and captive by the clip is rather difficult to slip into place, but with patience and fortitude, anything is possible. I’ve learned to work at the very tips of the needles for this last stitch, in order to keep from stretching things out of whack. All done! 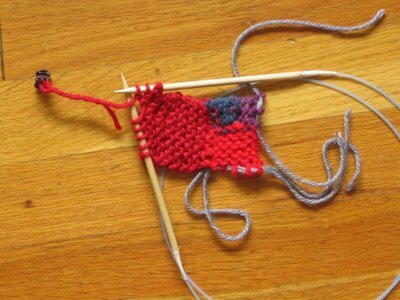 Now, rotate clockwise, pick-up and knit! …so I had to knit up one of these, too. What fun! 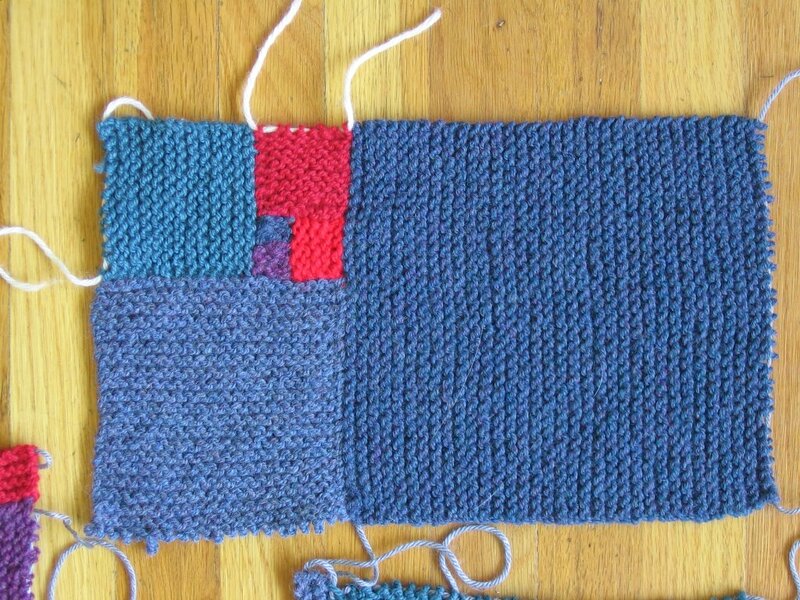 Maybe, in the future, I'll knit an afghan out of nothing but Fibonacci Sequence rectangles. From Chopsticks to needles in no time flat!